Puffy eyes may be caused by transient stress, fatigue, allergies, aging, gene, or certain medical conditions. Appropriate treatment depends on the cause. People hate having swelling eyes as well as dark circles around the eyes. They make you look tired or older than you really are. Although beauty magazines often suggest applying home remedies such as cool slices of cucumber over the eyes, it usually come back, especially if they are caused by allergies or if they are part of your natural facial features. To find out how to relieve it, we will first discuss what causes them. While having swelling eyes may be a transient condition caused by brief episodes of crying or stress, it can also be an inherited condition which may run in the family. 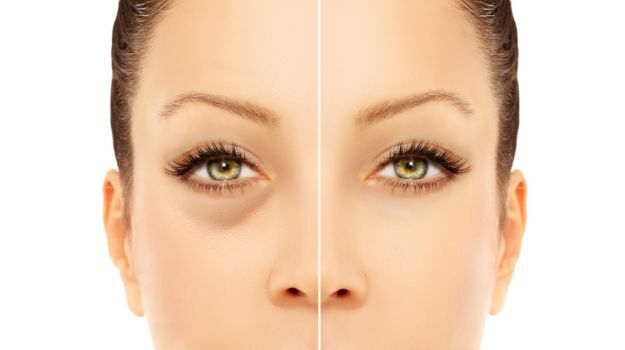 Changes in skin elasticity related to aging may also influence swelling eyes, since the thin skin is no longer able to hold back fat content in this area. Thyroid disease (Grave's disease)can cause symptoms like swelling eyes. For example, people with thyroid eye disease can develop swelling and bulging of tissues around the eyes. Hay fever may be related to eye allergies, while hypersensitivity to other food or substances can also lead to eye puffiness. The swelling is due to fluid leaking from the blood vessels, which is triggered by histamine release during an allergic reaction. Eye infection (pink eye) is often accompanied by inflammation and swelling eyes. Serious kidney disease, which causes excess fluid buildup due to failure of excretion can lead to generalized edema, including puffy eyelids. Resting the muscles for an extended period such as when sleeping can encourage fluid to accumulate in the area. During sleep, the eyes do not move and you do not blink. Therefore, fluids can accumulate and make you have swelling eyes in the morning. This is just like having leg edema when you sit or stand for a long time without moving the legs. When the muscles start moving, fluid is pushed back into the circulation and swelling eyes, just like leg swelling, disappear after a few hours. It is important to first determine the main cause for swelling eyes to be able to find the proper solution. In some cases, it is necessary to treat an underlying medical condition to improve the eyes' appearance. Consult a doctor if you have other symptoms that signal some disease, which might need immediate medical attention. For individuals who have similar facial features including puffy eyes as their parents or siblings, genetics play a role in their physical appearance. The only way to modify these characteristics is to have some cosmetic procedure that can help improve their appearance. Ask a cosmetic surgeon if surgery is the best option. Another possible indication for cosmetic surgery is loss of skin elasticity due to aging, which can be relieved by tightening the skin around your eyes. Eyelid surgery (blepharoplasty) is one such procedure, where excess skin and fat from the eyelids are removed. Your dermatologist may offer various cosmeceutical products (over-the-counter or prescription products) and procedures such as skin resurfacing and chemical peels to improve swelling eyes. It is important to remember that when applying any substance or products around the eyes, such as creams and ointments, you should avoid contact with the eyes, since these products can cause eye irritation or chemical conjunctivitis. It is also best to consult a doctor before applying creams or other products around the eyes to avoid unwanted complications.